This is another photo taken while we were living in China. But, don’t let that fool you into thinking these biscuits aren’t important. For one reason or another the photos were buried in my computer but I never stopped making this recipe. We have these several times a month, in fact we just had them last night! These are my absolute, last minute, what to have with dinner, go-tos. Of course, I don’t always make the jalapeno variation of this recipe. The versatility of this recipe is one of the things I love. 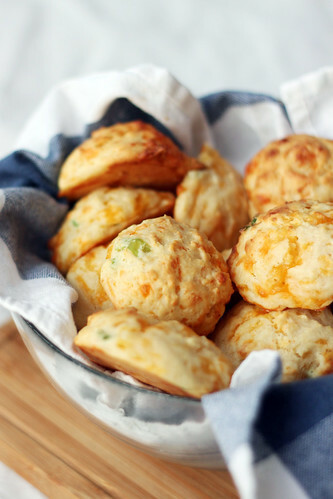 Sometimes I use white cheddar, sometimes I use chives instead of jalapenos, sometimes I skip the chives and jalapenos, I’ve even swapped a quarter cup of flour for corn meal and made a sort of corn biscuit. 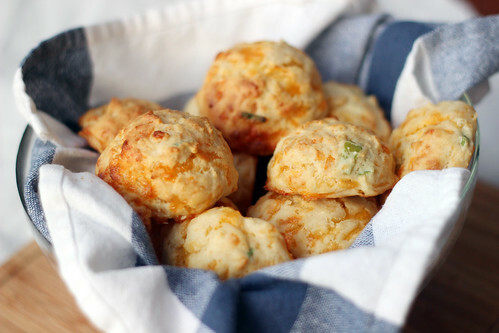 No matter how I prepare them, these biscuits always turn out flavorful, light, fluffy, and delicious. Oh, and they’re easy! *I actually like to use a cheese grater and shred the butter. It makes it super easy to incorporate into the flour. Just make sure you’re using very cold butter! **Alternatively, you can use freshly chopped chives or omit entirely! Preheat oven to 425 degrees. Prepare a baking sheet with parchment paper (or preheat baking stone). In a glass mixing bowl, whisk together the flour, baking powder, baking soda, sugar, salt, and cayenne pepper. Add the cold butter and use pastry blender or a fork and knife to cut the butter into the flour, until flour and butter make pea size clumps. Mix in the cheddar. Stir in the buttermilk and jalapenos and mix just until incorporated. Using an ice cream scoop (or 2 forks, making 1/4 cup portions), drop dough 2-inches apart onto prepared baking sheets. Bake for 12-14 minutes, rotating baking sheets as needed. This is a recipe I’ve had my eye on for quite some time. 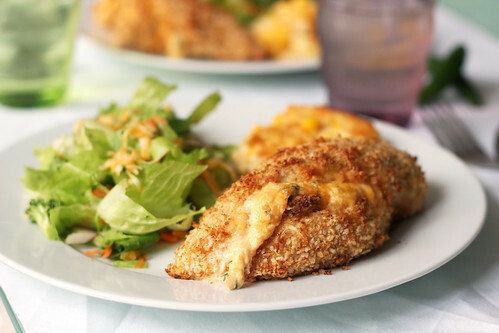 Jesse loves crispy breaded chicken, especially if it’s stuffed with cheesy gooey goodness and I love jalapeno poppers. It’s like cream cheese and jalapenos are a match made in heaven. I have no idea why I waited so long to finally give this recipe a try but it’s a keeper and is definitely going to be a regular at our table. The only adjustment I made was to use Panko breadcrumbs with a added seasonings instead of a mix, since Panko is easier to come by in China. 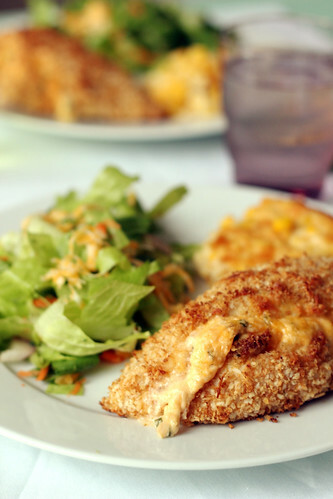 I served the chicken with a side salad and corn casserole (recipe to come). Yum! Preheat oven to 350 degrees and prepare a cookie sheet with light spray of non-stick spray. Heat olive oil in a skillet over medium-high heat. Add the jalapenos and cook until softened. Remove the skillet from the heat and add the cream cheese and shredded cheese, stir to combine. Cut a pocket into the each chicken breast. Stuff each pocket with the cream cheese mixture. Secure with a toothpick if necessary. In a small bowl, whisk the egg. In another small bowl, mix the Panko, taco seasoning, parsley, oregano, and salt. Dip each chicken breast in the egg then the Panko. Place the breaded chicken breast on the prepared cookie sheet. To help give the breading a deeper color, you can give each breast a little spray of oil. Bake for 30 minutes, or until the chicken is no longer pink inside and the juices run clear.